This unit is absolutely the best, three-bedroom, direct oceanfront unit available. Remodeled bathrooms to include new fixtures, ceramic tile and granite countertops. It has been exquisitely decorated with leather furniture, newer appliances, and a fuilly equiped kitchen. You will find all the comforts of home throughout this large unit of almost 2000 square feet of luxury. Linen and towels are provided. Bedrooms are spacious and each has its own private bath. There is a dining room with six chairs, dinnette seating space with four chairs, and a breakfast bar with four chairs. Enjoy your breakfast or lunch from the large patio overlooking the pool and beach. Bathrooms have been remodeled to include new fixtures, granite counter tops and tiled showers. Just a quick ride down the elevator and you are on the sandy beach of Daytona Beach! There is nothing more relaxing than sitting on the balcony with your cup of coffee and listening and watching the ocean. All bed linens, bath towels and kitchen towels provided. Sorry no beach towels provided. Complimentary WiFi access in the unit. Full size refrigerator, stovetop, oven microwave and dishwasher. Toaster and Coffee Pot. Just like home! (3) Master bedroom, 2nd bedroom and living room all have tv's with cable. Living room has new Flat screen TV. Balcony is direct ocean front with access from the master bedroom and living room. We had a wonderful Christmas! Thank you McCarthy family! We had a wonderful stay at the White Surf #208. Lots of room for everyone. The location was nice as it was not flooded with boardwalk crowds. Sunglow pier was just a short walk away. I only suggest some new bedding and a few pieces of furniture/appliances needs replaced. But with that being said I know the sea air can be harsh on such thing. Would definatley recommend to others. Overall we enjoyed our stay. Location was perfect. The balcony and view were amazing. Couldn't ask for any better. Only downfall were the beds which weren't all that great. They really need to be replaced. Otherwise we had a great time. The condo is nice and spacious. Everyone was friendly. Easy parking and lots of local information given. Easy to get in and out, near the pier. Beach area was perfect and pool area was nice as well. Our family stayed a week over Christmas and thoroughly enjoyed life in this condo. It is spacious with plenty of room for everyone. The views of the ocean are terrific from several rooms and the balcony is a great place to hang out and watch people and the surf. Location is great. The wifi seemed inadequate meaning we did get reception in the master bedroom or while on the balcony. A minor inconvenience. Would certainly stay again. Excellent customer service from owner and booking agent. My family and I had a great week in this beautiful condo great view of ocean everything was just as shown in pics will stay again when we return and have need of 3 bedrooms. We even stayed an extra day. Thanks for your time and review. We were glad we could accommodate your extra night. We look forward to welcoming you back again. If you travel with a big party or children you´re right here. This 3 beedroomcondo is spacious. It is equipped with everything you need, including stuff for a stay at the beach. 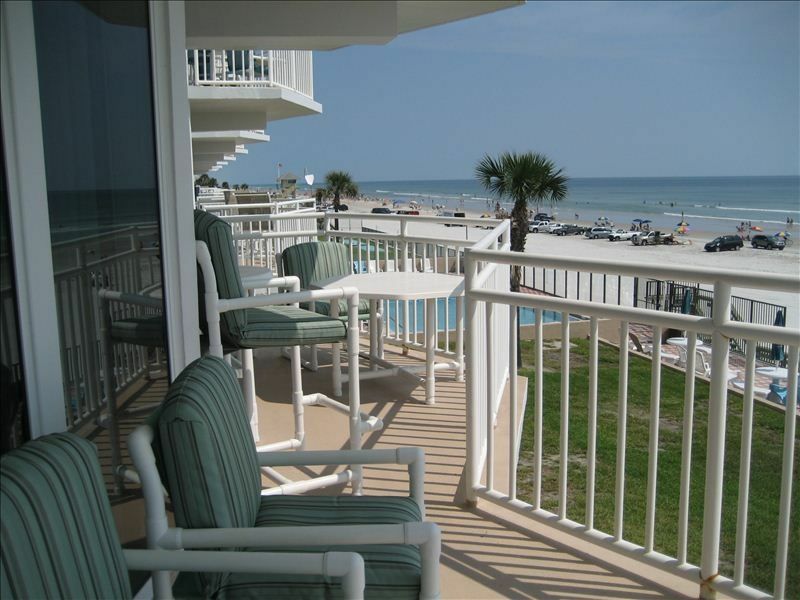 The view from the balcony is breathtaking and you can watch the beachlife from easy couch or chairs. Ask Sue for something you miss(i can´t imagine). She will help you quick. We are truly delighted to read that you enjoyed your stay and that the condo was well equipped to meet all of your needs. At the beach you want the views and this condo has them. Even while you are relaxing on the couch or cooking in the kitchen, you do not miss out. Thank you for sharing your comments and we look forward to welcoming back in the near future. TWO WONDERFUL WEEKS DURING THE HOLIDAYS. THE UNIT WAS EXACTLY AS INDICATED BY THE PHOTOS AND TEXT. ALL YOU NEED FOR A GREAT VACATION AT THIS CONDO IS YOUR PERSONAL CARE ITEMS, FOOD AND BEACH WEAR. THE CONDO HAS EVERYTHING NEEDED TO MAKE YOUR STAY PERFECT. GROCERY STORE JUST A SHORT DISTANCE. THE VIEW AND BEACH ACCESS WAS EXCELLENT. VERY ROOMY AND CLEAN. WE ENJOYED OUR TIME SPENT THERE AND WOULD BOOK THIS CONDO AGAIN. We are glad that you enjoyed your stay over the Christmas holiday. Thank you for your feedback on the condo. We strive to make the condo feel at home and try to keep it fully stocked with all the comforts of home. We look forward to your return on your next vacation.